Welcome to 5725 Sidmouth Street, a three bedroom detached brick home situated within Mississauga's high demand East Credit community. This home features double garage; aggregate concrete driveway, front walkway, and covered front porch; landscaped front gardens; and a fully fenced backyard with aggregate concrete and stone patio areas, and a garden shed. The main level showcases many recent updates, and features ceramic tiled and wooden floors; contemporary ceiling fixtures and pot lighting; a mirrored door double coat closet in the foyer; and a powder room off the main hallway. The spacious open concept living and dining rooms have an easy flow to the kitchen area - where light coloured cabinetry and a stone countertop contrast strikingly with the dark and greyish tones of the mosaic bask splash and the stainless steel appliances. The adjacent breakfast area walk-outs out to the backyard and patio area, extending the entertaining space during the warmer months. 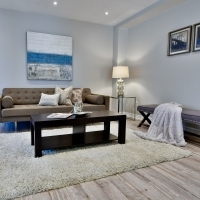 The upper level features wooden flooring throughout; two spacious bedrooms that share an updated 4-pc washroom; and a master bedroom with walk-in closet, as well as an updated 4-pc ensuite with ceramic tiled floor and walls, and a relaxing deep tub. The finished lower level has laminate floors and pot lighting; plenty of storage space; a large recreation area with a walk-out to the backyard; a modern 3-pc washroom; and a laundry room. This home is within walking distance to Whitehorn Public and St. Raymond Elementary Schools, Pickwick Green and Garcia Parks; and is just a short drive to the Heartland Town Centre, and for access to Hwys 401, 403, and the 407. Another home enhanced,furnished,embellished,staged & listed by Raj & Preeti, the Realtors, you can trust on!